There seems to be a movement in the audiobook industry these days toward recording everything under the sun, and doing it as cheaply as possible, with the idea that the more audiobooks we produce, the more people will listen to them. That may be true to some extent, but I think there's a danger in overestimating the demand for audiobooks, and underestimating the expectations of current (or future) audiobook customers when it comes to quality. To be of real value, an audiobook has to do more than just deliver information, or simply replicate the reading experience--it has to improve upon the reading experience, to the extent that it becomes desirable in and of itself: an entertainment, worth seeking out for its own sake, not just an adjunct to the text. That's what's exciting about the current state of the business: there are so many programs out there now that enhance, even supercede, the print experience. If it's only about information, it's easier and cheaper to substitute currently available (and rapidly developing) technologies--which, while they may leave something to be desired, are reliable, ubiquitous and FREE. Just tap a button on your laptop or Kindle and let it read to you. Driven by three decades of growth and competition for market share, audiobook standards have reached a remarkable level of consistency, such that today you can browse a clearing house like Audible or WeRead4You, select a title at random, download it, and be reasonably sure you're getting something you can relax and listen to. Truly sub-standard audio programs are becoming pretty scarce these days. In fact, I'll bet if you asked most audiobook consumers, they couldn't tell you what "brand" of audiobook they were buying--Blackstone or Brilliance, Tantor or Hachette. They buy titles, not brands. I really don't think most consumers can distinguish these days, which speaks well for the industry as a whole. But what happens when you start flooding this market with inferior products? What if standards are diluted, or even abandoned, to the extent that buying an audiobook becomes a crapshoot instead of a sure bet? You can't flip through an audiobook, you can't "try it" and, in the case of downloads, you can't return it! Once you commit, you're pretty much stuck. The fact is that the vast majority of Americans have neither the time nor the inclination to listen to audiobooks--and they never will. The people that do, form a small but dedicated core audience--one that will grow and solidify as more people get hooked on listening, which is not difficult. They won't get hooked, or stay hooked, however, if we're so focused on quantity that we forget about why people are drawn to audiobooks in the first place. It's not just about information, or convenience, or being able to hear anything you want. It's about the uniqueness of each and every listening experience. 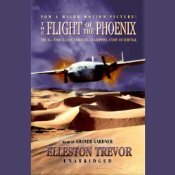 With this is mind, I'd like to offer today's title, The Flight of the Phoenix by Elliston Trevor. It's a terrific book, but in my opinion it really comes alive in audio. With crackling dialogue, vividly drawn characters and a plot that lifts off from the first page, it's a great example of an audio program that attempts to create an experience you can't get just reading the book. I say attempts--I'll leave you to judge, but it was a tremendous amount if fun for me. Very interesting commentary considering some new, shall we say, initiatives in the industry. "To be of real value, an audiobook has to do more than just deliver information, or simply replicate the reading experience--it has to improve upon the reading experience, to the extent that it becomes desirable in and of itself: an entertainment, worth seeking out for its own sake, not just an adjunct to the text." Best thing I've read on the subject and allure (for the core among us) for audiobook format. Hear, hear.